Mangroves are salt-tolerant trees and shrubs found along coastlines between latitudes of ~30ºN and ~40ºS and occupy a broad range of environmental conditions including air temperature, sea surface temperature (SST), precipitation, aridity, and salinity (Quisthoudt et al. 2012). This polyphyletic group is defined by adaptations to a saltwater lifestyle rather than taxonomy, and is only represented by ~70 species globally (Spalding 2010). The same three species are found at the poleward range limits on both the east and west coasts of North America (regions that dramatically differ in temperature and aridity regimes). This group is an ideal model system for examining general questions about range limitation as the highest ‘velocity’ of climate-driven change is occurring in the coastal zone (Loarie et al. 2009), a region that includes more than 70% of the world’s population and some of our most biologically productive ecosystems (Agardy et al.). I am working in this project with John Parker and Ilka Feller (both at SERC). These populations represent both core (Panama) and expanding edge populations (Florida and Baja). 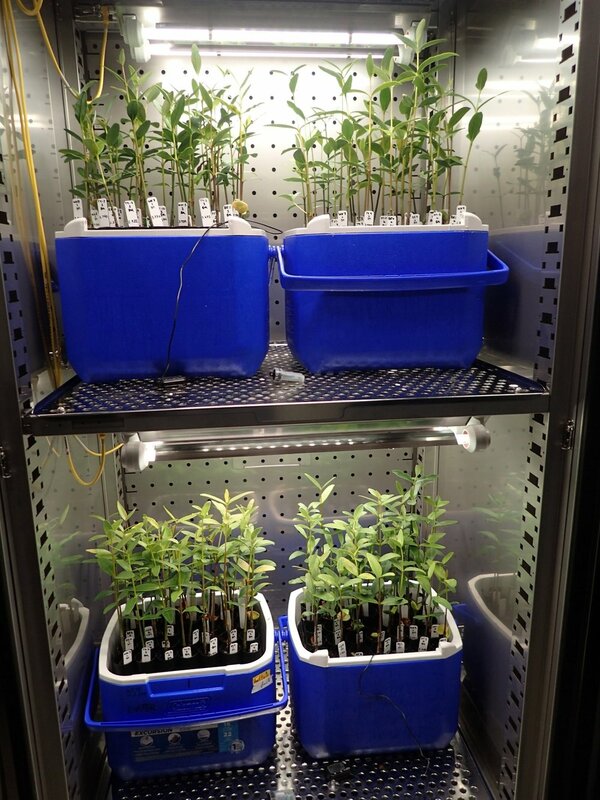 Half the plants were grown in growth chambers in a "temperate" climate and half in a "tropical" climate in a version of a reciprocal transplant experiment. Mangroves are not freeze tolerant and as climate change decreases the number of intense freeze events in Florida, their range is expanding poleward up the coast of the eastern USA (see link). This raises the question of whether these individuals are genetically adapting to have a higher freeze tolerance vs. being more predisposed to tolerate freezes due to living in a more temperate environment (plasticity). To test this question I grew 3000+ mangrove seedlings representing these three species from 12 populations (yellow stars above). Above, black mangroves entering a 24 hour freeze ramp down and back up! Each population was exposed to a "freeze" event in a freeze/thaw chamber (below) and their survival and trait expression recorded. Preliminary results demonstrate that population from core and range edges show differential genetic and plastic components of freeze tolerance. Plants from Florida are the most resistant to freeze damage supporting a genetic component to freeze tolerance in these species. Interesting while Florida and Panama white and black mangroves did not tolerate freezes better when then grew in a temperate environment, populations from the Baja range limit showed clear plasticity in freeze tolerance as a result of growing in a temperate environment. Each population expressed different base-line trait values even when growing in the same environment. Here you can see that individuals from some parent plants have a higher protective anthocyanin content in their leaves (the reddish coloration). We also measured a variety of other traits such as leaf toughness, stomatal conductance, and chlorophyll content to determine the function mechanism that might explain the differences in freeze tolerance we found. We also harvested whole plants at the end of the experiment and weighed them in sections to determine differences in plant allocation to various plant organs. Here you see the below-ground root systems of red mangroves.